Sean has spent twenty years in Third World war zones and natural disaster areas, fully embracing what he’d always felt was his life’s mission. But when burnout sets in, Sean is reluctantly drawn home to Belham, Massachusetts, the setting of Fay’s much-loved Shelter Me. There, he discovers that his steely aunt, overly dramatic sister, and quirky nephew are having a little natural disaster of their own. When he reconnects with a woman from his past, Sean has to wonder if the bonds of love and loyalty might just rewrite his destiny. Completely relatable, The Shortest Way Home is another perfect serving of a slice of life from the irresistible Fay. 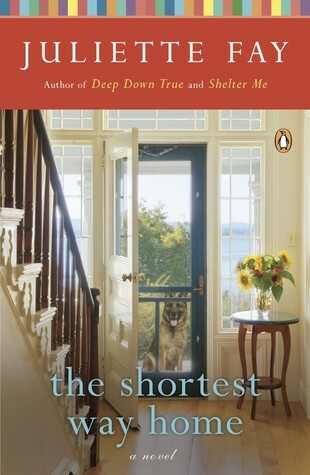 The Shortest Way Home was a really good read. This was my first time reading a book from Juliette Fay and I have to say I was really impressed. It's not too fast paced and it's not too slow. It's perfect. The description of the characters alone were written very well and I loved that they were very descriptive about the main character, Sean's, mother and the Huntington's disease that killed her. This is why Sean is the way he is throughout the story. Since the Huntington's disease killed his mother, it is a 50/50 percent chance that he will have it and will die from the disease. This plays a lot with Sean and the things he goes through. While reading I felt like I could see this on the Hallmark channel as a movie. I loved that even though there is a romance in this book and a couple of descriptive scenes, that it's not all about the romance and that the main character was a male, you don't see that a lot, especially with chick-lit reads. There's nothing more important to me than family and the fact that in this story Sean gets the chance to go home to help take care of his family was something that made me love the book even more. The bond that he forms with his nephew was a great add to the story as well. This is definitely a book I'd recommend to family members and friends. Disclosure: All opinions are my own. I received The Shortest Way Home at no cost for the purpose of this review. No other compensation was received.